It is the ultimate Daddy Fear (Mama’s as well): You hear through the grapevine that your sweet thirteen year old daughter is seeing a nineteen year old boy. Two worlds of maturity and relationship expectations collide. Few parents, if any, wish for such an occurrence. For any counseling “rule” there plenty of exceptions. There are good, loving, attentive parents whose child goes astray. Also, it must be noted that a mother’s influence on her daughter is of utmost importance. That being said, I find a great many dysfunctional teenage girls suffer from, at best, inattentiveness of their fathers. Some men, when they divorce their wives, divorce their children as well. Other men may be very busy with work and trying to support their family and have little time to spend with their children. Besides, with friends, computers and I Phones, it would seem as though they don’t really need us anyway. But they do. Despite these good reasons and excuses, the rule is this: girls need a positive male in their lives that will listen to them, talk to them (vs. lecture them), and make them feel important. This may be construed as mildly sexist, but girls need their Daddies. Protect your daughters from harm--you need to be the most important male in their lives. · Ask your daughter’s opinion of things. The purpose is to see how she thinks—and let her know you consider her opinion worth considering. · Remember, conversations with your daughter are not to change her mind. She likes a goofy political candidate? Merely ask questions, and let her talk. The purpose of most discussions is not to change her mind and prove to her she’s wrong. Rather, it is to show her you care about what she has to say. · Divorced Daddy? If you park her at home while you work, what’s the point of having her visit? Pick her brain for what she’d like to do. Have good conversations, less TV and have some fun. If she has activities back “home” (Mom’s home) that are important to her while she’s visiting you, take her back for the event(s). In doing so you are saying to her, “If it’s important to you, it’s important to me”. It’s a sacrifice, and kids need to know we are willing to sacrifice for them. · Don’t shy away from proper discipline. We are trying to give her a model of a good male. That includes being strong and brave when we need to be. Provide her with good moral guidance. 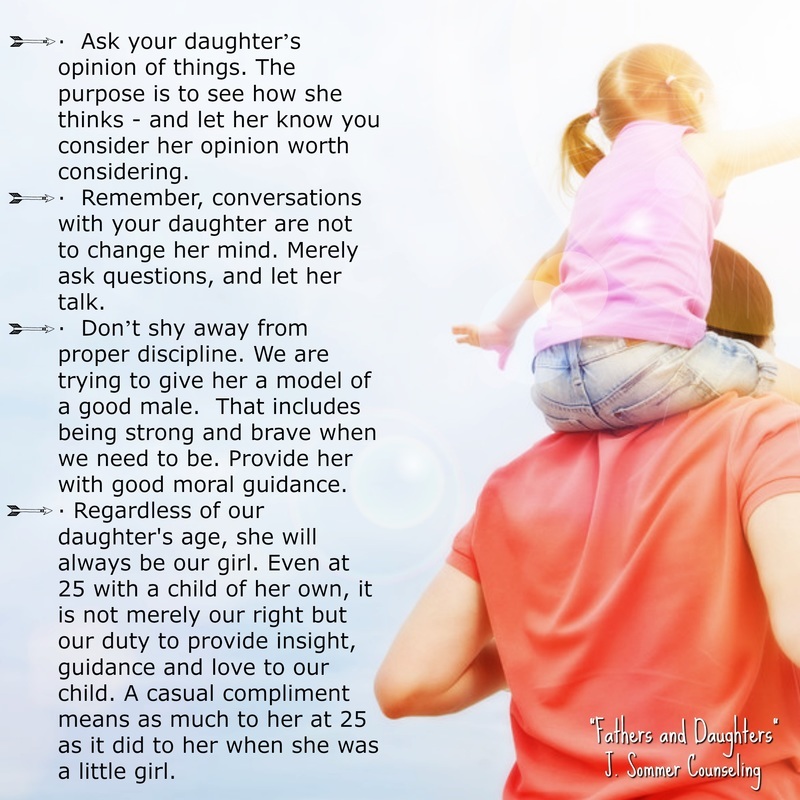 · Regardless of our daughter's age, she will always be our girl. Even at 25 with a child of her own, it is not merely our right but our duty to provide insight, guidance and love to our child. A casual compliment means as much to her at 25 as it did to her when she was a little girl. Never stop being a good father and male role model, regardless of your girl’s age. Help her feel important, loved and needed, and always take good care of her. You don’t want some dysfunctional guy stealing her heart? You steal her heart.